Fraser River Paint and Body Ltd.
From assisting you with insurance claims after an accident, to laying down the last coat of auto paint, Fraser River Paint and Body Ltd. is dedicated to providing best-in-class auto body services, including glasswork, painting, dent repair and beyond. We’re pleased to serve private customers, as well as commercial fleet vehicles and industrial equipment. When it comes to restoring the integrity of your vehicle’s appearance and infrastructure, Fraser River Paint and Body Ltd. cuts no corners. We’re the leading destination for auto body repair in British Columbia because we take an unparalleled approach to quality, no matter the scope of your vehicle’s needs. From auto glass repair to paint, fender repair, rust remediation, panel replacements more, we go above and beyond to ensure your vehicle is restored to a like-new level of excellence. We have two auto spray booths with down draft technology. We have two truck spray booths with down draft technology. Our facilities are equipped with commercial truck and car frame racks. We’re President of the Braid Street Industrial Park. We’re pleased to be a member of our local Chamber of Commerce. We’re the recipient of the Large Business of the Year – Platinum Award 2016. We’re an ICBC Express accredited facility, providing you with full peace of mind in our service capabilities. We offer all of our customers a free estimate on service. Whether it’s a new paint job or a new windshield you’re looking for, you’ll find it at Fraser River Paint and Body Ltd. Contact us today for a free quote on any of our services.
" 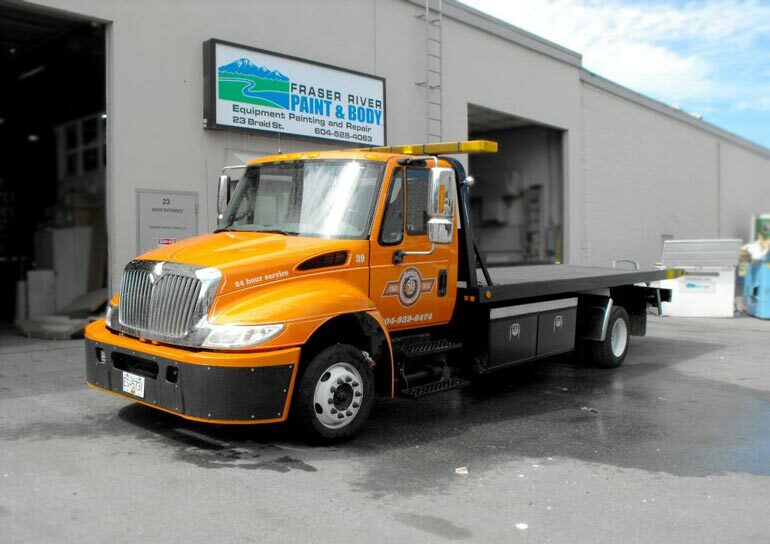 I am a business owner with a fleet of trucks ,i am so pleased to find Franco and Fraser River Paint An Body, my experience with them has be..."
"Took my Cayenne in to be repaired. They did a great job on the repair and on matching the paint. The service and experience was great from..."
"After an accident Fraser river were the only ones i trusted with my truck. They got the job done fast and efficient, but most importantly it..."
"We having been bring our fleet and person vehicles to Frankco for over five yrs. I won't go anywhere else. " "Franko and crew fixed our car after a hit and run, super fast, amazing quality of work!! Wouldn't hesitate going back, or sending friends an..."